At one time, the Nuremburg, now International Electronics Corporation, was a large camera manufacturer. Today, cameras are just an after thought for this company that’s more known for its coffee makers, shavers, and innumerable other electronic household products. But, back in the fifties and sixties, it had a vast lineup of innovative cameras – many of very high quality, especially in 35mm format. But they also had a bevy of medium format folders. In 6×9 they offered the Norica which was a simple but decent folder, the most worthy was the Norica IV and Norica Super II. These were often fitted with Steinheil f4.5/104mm Cassar lenses set in Prontor-S shutters. A basic camera/lens/shutter for the price-conscious. 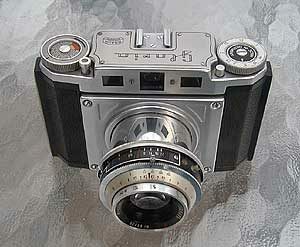 However, the medium format Braun camera that really intrigued me was the Braun Gloria of 1954. The Gloria is a “Tube” camera, in a sense a folder. This camera, instead of having bellows, had a stainless steel tube, that at the press of a button sent the lens/shutter to its appointed place away from the body, much like the bellows and front standard of a folder. The lens fitted was often the f2.9/75mm Paxar in a Prontor-SVS shutter (sometimes found with a Prontor shutter). 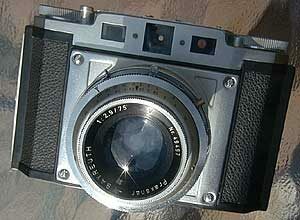 The camera is well made, no Leica or Agfa Super Isolette, but compares very well to the folder genre. When I first got my hands on one of these, I was really impressed with its design and even its capability. It’s a camera much more fun than a Holga… The lens pops out like a Jack in the box, which I guess it really is!